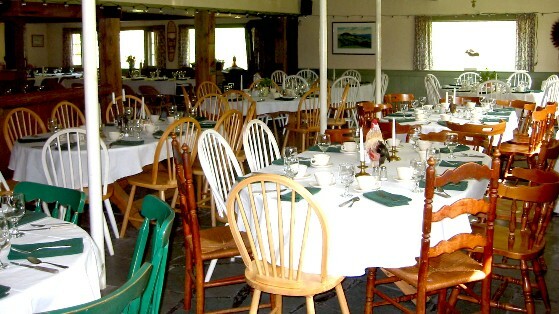 What makes Pierce’s Inn truly special is that we rent the Inn to one group at a time for private functions. Groups enjoy the great food and comfortable accommodations in a warm space, free of hassles and distractions. We host events of all kinds; family reunions, retreats, workshops, meetings, dinner parties, college and high school reunions, groups of friends, sports teams, sports team banquets, weddings, civil union celebrations, rehearsal dinners, wedding parties. People enjoy the comfortable and relaxed environment which encourages fun, productive gatherings. The combination of the peaceful country setting, the comfortable living spaces at the Inn and our own personal appreciation for people creates a truly unique experience. We have dining space in our dining room for 95. We have space for a big tent on the lawn. Groups that come for retreats, meetings and workshops find the living room, the dining room and the entry/boot room for their various meetings and breakout sessions. In the warmer months, the front yard with Adirondack chairs makes a nice meeting spot as well.